Being the best is about being better than the rest! And when it comes to the quiz contests; there is no stopping to the team of LetsNurture. But as we are an IT company, our quiz contests are generally based on giving and gaining technical knowledge about Android, iOS, Php, SEO, content and designing. 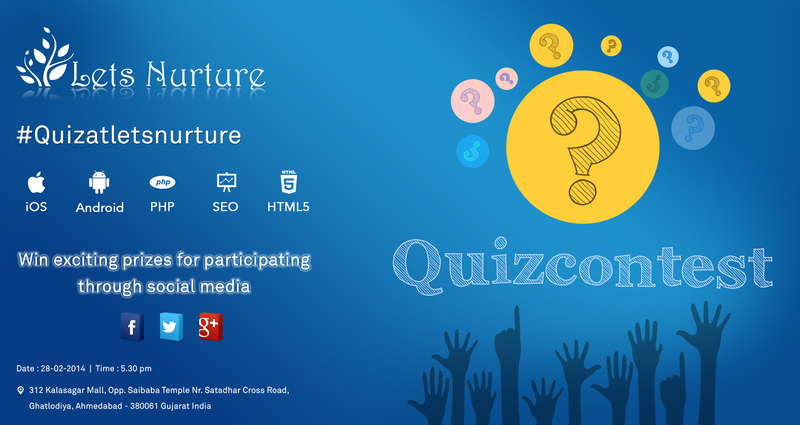 LetsNurture is planning to organize a Tech Quiz Contest today. Mr Utpal Betai and Mr Ketan Raval have jointly planned this event to update the knowledge of employees and uplift the spirit of togetherness. With nurturing always on our minds, we planned to come up with a quiz contest which will help our team to update and explore the knowledge about the ever growing tech world! The teams consist of 5 members and they belong to different departments of our company. Every team has one member from each department making it robust enough to win the contest. The anchors for the Quiz Contest are our ever lively members and android developers Pratik and Priyank. The SEO team will be on its toes by tweeting the event live and also hold quiz contests on twitter. The participants that answer will be given a chance to win exciting prizes. So wait n watch! We have left no stone unturned in coming up with exciting prizes for the winners. Decide which one do you fancy? So what keeps you waiting? Fasten your seat belts, answer the quiz online and take away the prizes as well as cash vouchers that will bring a smile on your face! Put on your thinking cap, update your knowledge and tweet for #QuizAtLetsnurture and follow us to discuss more @LestNurture.